Video stars Rhodri Marsden, who started hashtag in 2011. Twitter has thrown its support behind a homelessness awareness campaign that encourages people to share their stories about seasonal sleeping arrangements. The #DuvetKnowItsChristmas hashtag, created in 2011 by writer and musician Rhodri Marsden, invites Twitter users to use the hashtag and share their festive stories. This year, Twitter created a video for the campaign for homeless charity Shelter. 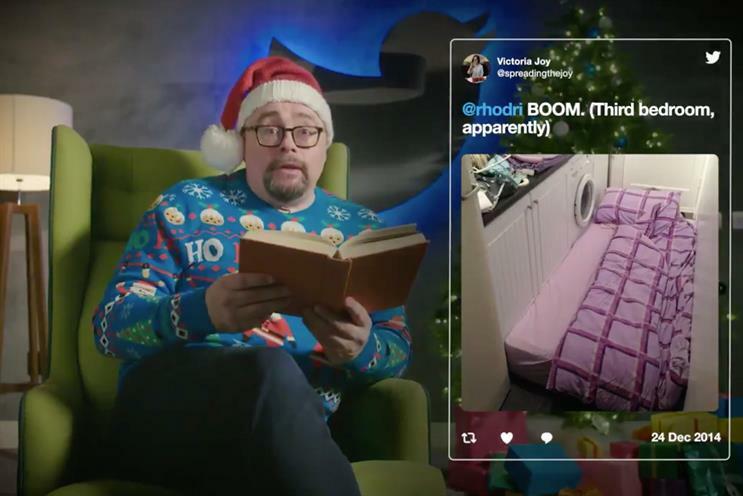 #DuvetKnowItsChristmas is a brilliant Twitter tradition where people Tweet @Rhodri to share their often hilarious seasonal sleeping arrangements. This year we’ve partnered with @Rhodri and @Shelter to tell the story. Not everyone has a home at Christmas, please give what you can. In the two-minute film, created in-house, Marsden reads a short poem he wrote that features some of the thousands of tweets that have used the hashtag over the years. The tweet that hosts the film links to Shelter’s website calling for donations. The hashtag has been a regular feature on the social platform over the festive period after Marsden first tweeted about his own seasonal sleeping arrangements at his parents' home and sparked a trending conversation. Last year, Marsden produced a compendium of humorous stories from the campaign in A Very British Christmas: Twelve Days of Disomfort and Joy. Dara Nasr, Twitter’s managing director, said: "The '#DuvetKnowItsChristmas' meme has also been something of a phenomenon, covered by the media, and there is even a book. It would be great this year if we could use its power to bring people together to do some good, as not everyone has a home at Christmas, which is why we’re delighted to have partnered with Shelter." Crisis of attention? What crisis of attention?